I am loving the cool weather which just began yesterday – though daytime highs will approach 80° F by the end of the week. I have probably foraged the last of the chanterelles for the season, so I wanted to have a dish that featured them. I had just enough for a hearty pasta dish for one, but I am including a recipe for four. I am not particularly fond of grocery store mushrooms – the bland button mushrooms that are also called “champignons de Paris.” I find that I have to cook most of the water out of them before they have much flavor at all. 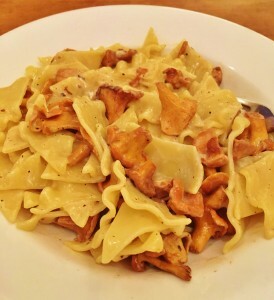 Chanterelles (also called girolles in French), on the other hand, should be quickly cooked to preserve their flavor. Resist the temptation to adorn this simple recipe with more butter or cream. 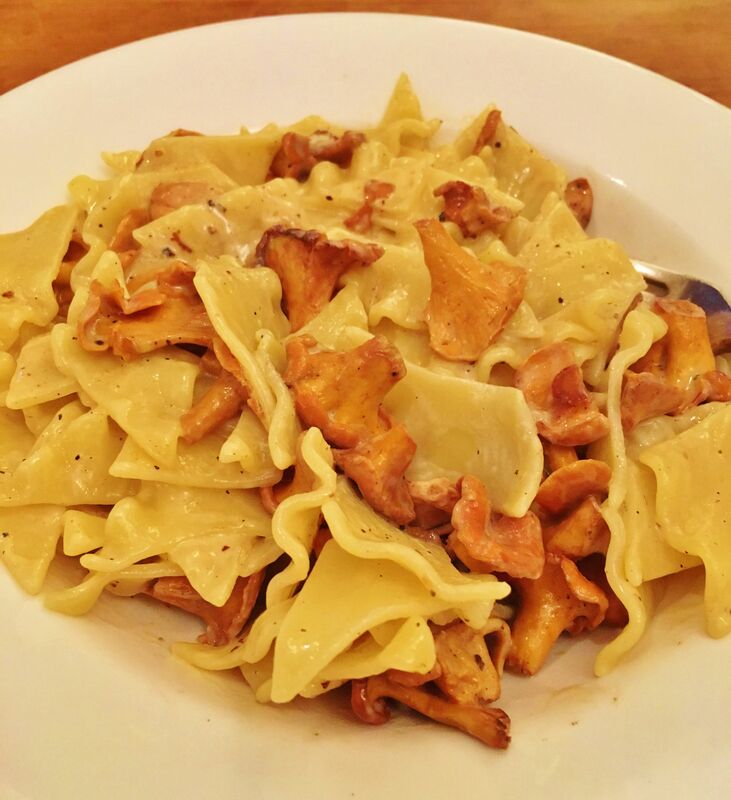 The small quantities are perfect to show off the distinctly nutty and spicy flavors of chanterelles. Use the pasta of your choice for this dish. I have used the crimped flat pasta called Pantacce Toscane, but any will do. The dish assembles very quickly, so begin boiling your pasta water while you prepare your ingredients. I don’t generally wash the mushrooms, but clean them assiduously with a mushroom brush or an old, soft toothbrush. Bring a large pot of water to the boil, salt the water, and add the pasta to cook while you prepare the sauce. Drain the pasta and add to the pan, toss well, and divide into four pasta bowls.